I left one of these at the back of a bus in 2002, never to see it again. Now 17 years later I've bought one off eBay and it's everything I remember, super slim, and despite this sturdy and very well made. The sound is very good, and the gumstick batteries are still going strong. 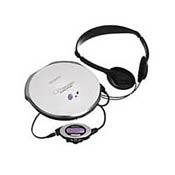 This was the flagship Sony discman for 1999/2000 and you can definitely tell it was top of the range for the time. The remote is very nice, although looks a bit dated next to the later cylindrical ones they brought out on later discmen and minidisc players. The rechargeable batteries that go inside the discman are gumstick type, so on the expensive side to replace. You can get around this with the external 2xAA battery pack but it's not ideal having it dangling around. Bass, Treble, Battery Life, Design and Stability. Remote could use more work. OK...I bought my D-EJ915 off Ebay and It arrived broken! This was because the player was basically sent to me in an envelope. If your wondering, I dropped the player from my backpack and It still works perfectly fine. After paying $40 to fix it, the player was more than could dream of. The bass! First I used these cheap ear buds and I got good bass. Then I used my $50 Sony MDR-E888sp's and WOW! Bass heaven! The batteries that I got with them were pretty dead so I didn't get to experience the maximum battery life but they played for 6-10 hours. The remote feels pretty cheap for and Item with a $92 replacement price. It's pretty small and can be troublesome if you don't put it on hold. I like the stick remote which was made for the D-EJ855, 955, and 1000. It looks and feels sturdier. Other than that the player is Great! OH I almost forgot. YOu jaw will drop and it's depth! I was complely shock by how thin it was. Put two CD case together and it's thinner than that. People still say "S--- that's thin!" MAY BE, (i`m not sure) Sony brand adds some stiff price; however the price I paid after bargaining is well worth it and may be harsh sounding compared to tube systems, but stunning performance for a portable player. this product`s sound can be described as clear, detailed and crisp; however not warm compared to tube sounding devices. I almost always listen classical with it and I enjoy; however I think it would excel in rock, pop and metal(basic but powerful rythms which make me sick). Two major pros of this product are it`s elegantly designed sleek style and superb overall battery life (about 50 hours with rechargeable batteries only). It is discontinued now, DE-J925 took it`s place, however 915 is more elegant and I love it. Recommended especially for pop rock and metal listeners. bought it from my friend who just got the new D-EJ925 or something. this little thing is awsome. its one of the smallest cd players out right now. its great, except for the stock headphones...but i never use the stock headphones anyway. have it connected to my NHT SuperOnes thru my reciever, sounds great. I owned the Panasonic SLS-231 and after a year or so lost it during a move, and boy am I glad. Initially I bought the Panasonic SL-CT570 as a replacement, its probably their smallest one right now and one of the top of line (besides the Shockwaves). After using it and feeling the less-than-adequate build quality, I went to the Sony Store and picked up the D-EJ915, and man it rocks. I LOVE how small this thing is. The claims of 60 hours battery life are about right, I think the previous person misinterpreted it, the 60 hours is WITH the external battery pack which holds an extra set of AA's. I never use it though because this baby comes with a set of proprietary Sony nickel metal hydride batteries. They are ultra slim (partly responsible for the unit's small size) and charge up right inside the unit (when plugged into the wall). I find they give me plenty of playback time (est. 15 to 20 hours or so) and of course charge up with no memory effect. Eventually of course they'll wear out which means I have to order a pair from Sony, I don't know what they would cost, that's a drawback. Other than that, I LOVE the sound quality, comes with a good set of headphones; I found that the volume is excellent and goes very high, as high or higher than both the panasonic's. The remote is VERY functional (unlike the dinky thing that comes with the Panasonic CT570). You can hide the unit wherever you want on yourself, and just have the remote clipped to you and operate literally all its features from there. Very effective and a really really cool backlit screen. It never skips at all thanks to G-Protection (no more out-of-date antiskip memory needed here). The fit and finish are superb, it really feels like a quality unit. Over all, other than the possibility of having to dish out big bucks for batteries in the future, I LOVE this unit and recommend it whole-heartedly. I do have to say that I like this discman overall, but some of its selling points can be misleading. The advertisement boasts a 60 hour battery life (Lithium-ion gumstick), but after extensive use with it, I found that the battery rarely lasts over 20 hours. However, the shortened battery life is due to the skip protection. From my understanding, the G-protection functions only when the unit is bounced around, and I assume that the protection also takes up extra battery life. Also, I generally use this player while walking, riding the subway, and flying. The plane and subway are generally rather loud, and therefore I need to turn the player up a fair amount to hear it well (around level 7 or 8). The problem that I have with the skip protection is that while advertised as a close to perfect solution, I find the player skipping more than it should. I have gone jogging with it, and if I strap the player to my waist very securely, it only skips a few times in a 10 minute run on a dirt road. However, I find the fact that the player skips occasionally while I'm walking unacceptable. I find that the sound quality is not excellent, but I don't expect much from a portable anyway. It sounds alright on my pair of Sennheiser HD545s, and has just about enough power for use on a plane, but not quite enough. The case that comes with the player is hard to use, and requires time, space, and much effort to change CDs. Although there are some apparent flaws in the player, I find that the size and weight of it are helpful for transportation, and it fits my needs. Size, battery strength, weight, aesthetics. This is 4th portable player I've purchased and I have to say it is the best. The most recent player I had was Sony's DE-J805. The sound quality blows away anything I've owned. The only bone of contention I have are the headphones. They do not bring out the quality of the player. If you are looking for a pair of headphones, I would recommend the Sony MDR-A44L. They are the vertical in-the-ear design and the bass response from them is fantastic.